If you have seen the movie Enchanted, you have seen the perfect portrayal of our youngest daughter Isabelle. Even before the movie, Isabelle was Jazelle. She is a cartoon princess in a real life world. She truly imagines herself a princess. When someone asks her what she will be when she grows up, she looks at them as if they were ignorant, and says, "A Queen. " She has seen the movie Enchanted 3 times. All week long, she has been lining up her animals in a row and singing them "The Happy Working Song." If you haven’t seen the movie, watch the video below. When Jazelle sings the song, rats, mice, cockroaches, and bugs come to help her clean. Today when I was in the shower, Belle lined all of her animals up on the toilet and bathroom floor and said, "OK Mom, now sing the Happy Working song!" I think Isabelle’s magic songs have worked. Today, I looked out my window and there was an opossum in my yard. In the 3 1/2 years we have lived here, I have never seen one. A few hours later, I was telling the girls about the opossum in the yard, and lo and behold, There was a skunk! I have opossum poop on our back porch to prove it if you don’t believe me. Belles songs and magic worked. 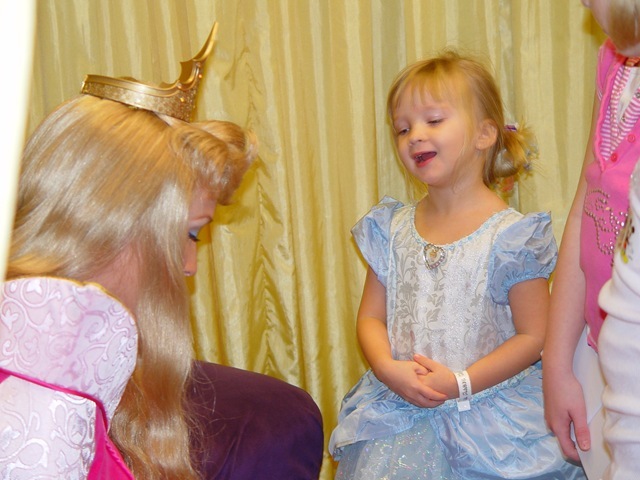 She is absolutely convinced of her Princess-hood now. The rest of us are all doomed to lives of wicked step mothers, old hags and evil sisters. I love the world of little girls! Belle and Lauren are so much alike! After five years of baths, Lauren took her firts shower yesterday: and I quote “Oh yeah, it feels like a bunch of warm fingers. (relaxing, slow and drawn out with her eyes closed) Oh, yeah, baby, give me the money . . .” She has never seen Jerry Mcguire, so I’m not sure where the money line came from, but it was hilarious!